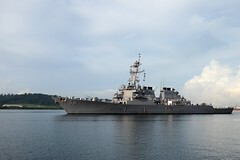 A U.S. Navy task group comprised of ships, aircraft, Sailors and Marines has arrived in the Philippines and commenced exericse Cooperation Afloat Readiness and Training, June 26. 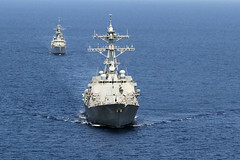 Seventh Fleet and the Navy Warfare Development Command tested maritime obscurant generator prototypes June 21-25 to assess their tactical effectiveness for anti-ship missile defense. 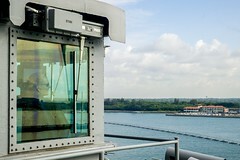 The George Washington Carrier Strike Group (GWCSG) arrived in Singapore for a goodwill port visit June 26. 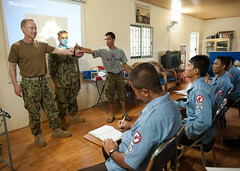 Pacific Partnership veterinarians and veterinary technicians provided a variety of services to the animals of Koh Rong Island, Cambodia, from June 19 to June 24, as part of this year’s mission. USS Pinckney (DDG 91) and KRI Slamet Riyadi (F 352) completed two days of tactical training June 24 as part of exercise Cooperation Afloat Readiness and Training. 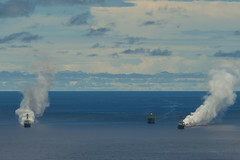 A multinational task force consisting of nine ships from four nations arrived in Pearl Harbor, Hawaii, June 24, after participating in a group sail from Guam to participate in the 24th biennial Rim of the Pacific (RIMPAC) exercise. 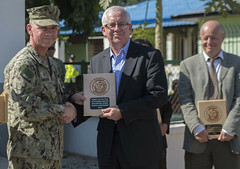 Service members and guests from Australia, New Zealand, Timor-Leste and the United States gathered at the Comoro Medical Center for a ceremony marking the end of the Pacific Partnership (PP14) 2014 in Dili, Timor-Leste, June 24.